This book was so intense. It grabbed me the minute I opened it. When I first opened the ARC, a paper fell out so I started reading. It was a blurb about Hurricane Katrina and all the damage it did. What people went through. When I finished, I was flabbergasted. FEMA didn't come around to help residents as they promised and residents had to fend for themselves. When I finished, I felt such sadness. And to make matters even worse, the blurb I read was the author's actual experience with Hurricane Katrina. The horror her and her mom went through. No wonder she was able to write such a great book. In Orleans, in this world, people live in tribes. But not your typical tribes. These tribes are made of blood types. A, B, AB, O positives & negatives. And these tribes are lethal. They'll scalp you for your blood, especially if you're an O-Negative blood type. O-Negative is a universal blood type where in this world has strong resistance to the Delta Fever. So tribes in Orleans are very scandalous and very brutal. Survival and leadership is their only goal. Can you imagine being a teenage girl, in a world where you fear for your safety because of the blood you carry? Well that's what Fen's life is like. Fen is an amazing protagonist. She's strong and very level headed. She doesn't let situations get the best of her. With a baby strapped on to her chest, she travels through Orleans in search of what's best for the baby. Through out her travels she comes across Daniel. A scientist who is at the verge of a breakthrough to find the cure for Delta Fever. Together they travel through the different areas of Orleans and wade through their brutal waters. Their goals are different but surviving is what brings them together. Orleans is a very brutal place, I wouldn't survive it at all. This story sucked me in and wouldn't release me until I finished it. 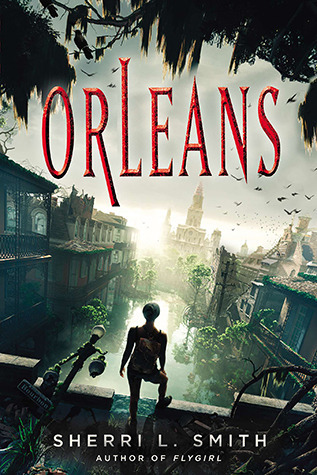 Orleans is definitely a 5 stars read. I'm not sure if it has a sequel but the way it ended, it left me wanting more. Orleans is a definite Good Choice for Reading! Wow that letter you read sounds super intense! I had no idea that this book was inspired by some real experiences. That's pretty cool! I'm happy that you loved this book. It wasn't quite my cup of tea but I could tell that there was some terrific world building! Hi Ashley, it was a complicated story. But I think the letter made me enjoy the story more. It was such a heart breaking experience for the author and her mother. Really sad. I'm happy that she shared that with us. Excellent!! I've had my eye on this book for a few months now. The premise sounds fantastic and I love that it's more 'brutal'. It sounds like a scary world to live in. I'm dying to read this book, but the only problem is finding it for me right now...thanks for your honest review. I love apocalypse stories! This sound like something I'll really enjoy, so I'm going to try to find it for my Kindle...Thanks for the review!